It is Difficult at Times But. Revenge is an ever expanding circle of destruction and pain which envelopes not just those involved but also a lot of innocent lives as well. Most of the shootings that occur at schools come from a student being bullied and wanting revenge. How many innocent lives are taken because of the action being taken? Sometimes you want revenge so bad you can taste it. That is the vile liquid of the devil which will only destroy you as well as your victims and innocent bystanders. That is why we must leave vengeance in the hands of the all wise Jehovah. He knows the perpetrators far better than you so He knows the right manner in which to deliver justice and at the right time. Categories: Christianity | Tags: assurance, Blessings, Christian, Christianity, deliverance, destruction, devotions, discernment, God, grace, Holy Bible, Jesus, justice, love, pain, photography, prayers, punishment, quotes, retribution, sermons, vengeance | Permalink. When I was a teacher and a student was naughty punishment was meted out. Before the punishment was given the student would cry and promise not to commit the offence again. About ten minutes later they would do the exact same offence. They were warned again. Again they said they were sorry and would cease to be naughty. Ten minutes later they would be back at it again. This time the punishment was much more severe than the original. So too it is with Jehovah. He will warn us when we are committing an sin willfully and deliberately against Jehovah. His anger will burn like hot coals against us and His hand shall be heavy upon us. Just read your Bible to confirm that. Just remember: you cannot con Jehovah.. There will be severe consequences for any fool that is stupid enough to try. Categories: Christianity | Tags: anger, assurance, Blessings, Christian, Christianity, devotions, God, grace, Holy Bible, Jesus, love, obedience, photography, prayers, punishment, quotes, repentance, sermons, sin, Truth, understanding, vengeance | Permalink. Unfortunately in todays society we see too much of children and grandchildren abusing their elderly parents and grand parents. They are useless freeloaders. The only time they have anything to do with their parents or grandparents is when they want money from them. If the parents and or grandparents need any help they children and or grandchildren are too busy to help. This is greedy and abusive. Beware, God is not mocked. He is a God of justice. Abusing your parents or grandparents is one of the filthiest thing you can do in the eyes of Jehovah and His hand will be heavy upon the wicked children and grandchildren. One thing I have noticed a change in recent years is that the parents and or grandparents get fed up with it becoming cold hearted towards the children and grand children and completely disinherit them. The children and grandchildren are so used to leeching off of their parents and grandparents they are usually in debt and expect the parents and or grandparents to bail them out. When the day of reckoning comes the parents and grandparents turn their backs on the children and grandchildren and they lose everything. Just as the prodigal son in Luke 15:11-32 went and blew his inheritance on himself and material things so too is todays generation. The difference is the prodigal son was repentant where as todays generation is too full of pride to repent and suffer the consequences. Categories: Christianity | Tags: abuse, assurance, Blessings, Christian, Christianity, Cruel, devotions, God, grace, Holy Bible, inheritance, Jesus, justice, love, photography, prayers, punished, quotes, selfishness, sermons, society, vengeance, wicked | Permalink. The Man who Deceives His Neighbor . 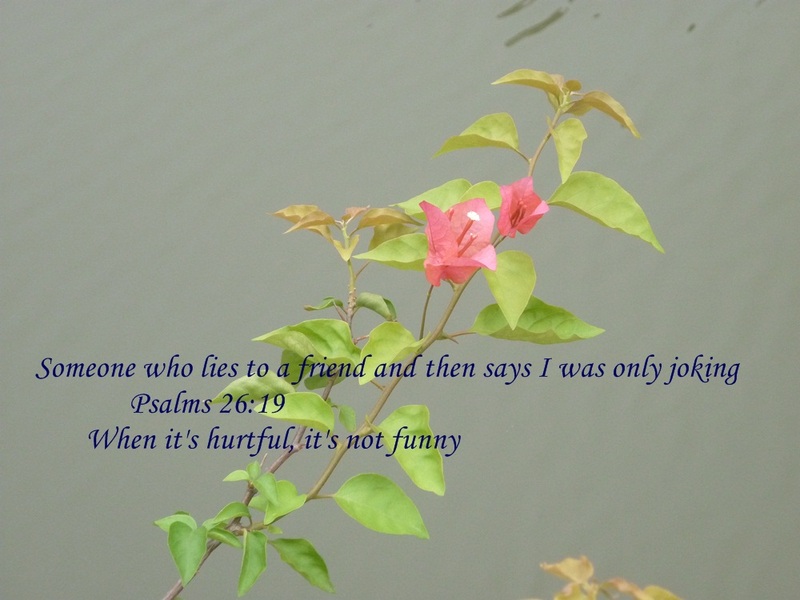 Like a madman who throws firebrands, arrows, and death, Is the man who deceives his neighbor, and says, “I was only joking!” Proverbs 26: 18-19 New King James Version It is not funny. Have you ever met any mean spirited souls? They are the ones who say mean and spiteful things to you to hurt you or make you angry and then innocently claim they were only joking. Their words are meant to pierce your heart like an arrow and burn your temper like a firebrand. They love t do it in pubic to shame you. Perverted because that is the way those sickos get their laughs. Wimps because when they get it done back to them the pout like spoiled little babies. Do not play their game and retaliate. I just say nothing and look at them like they are idiots. It infuriates them and they do not play that filthy game with me again. Do not be angry with them because they always end up all alone and filled with anguish. Oh they think they are getting away with it but Jehovah wreaks His vengeance in His own time in His own way. Yes we are to pray for them and forgive them but that does not mean we are to allow them to partake of their sicko pleasures with us. Categories: Christianity | Tags: abuse, advice, Deceives, Proverbs, quotes, scripture, sicko pleasures, society, spiteful, vengeance | Permalink.